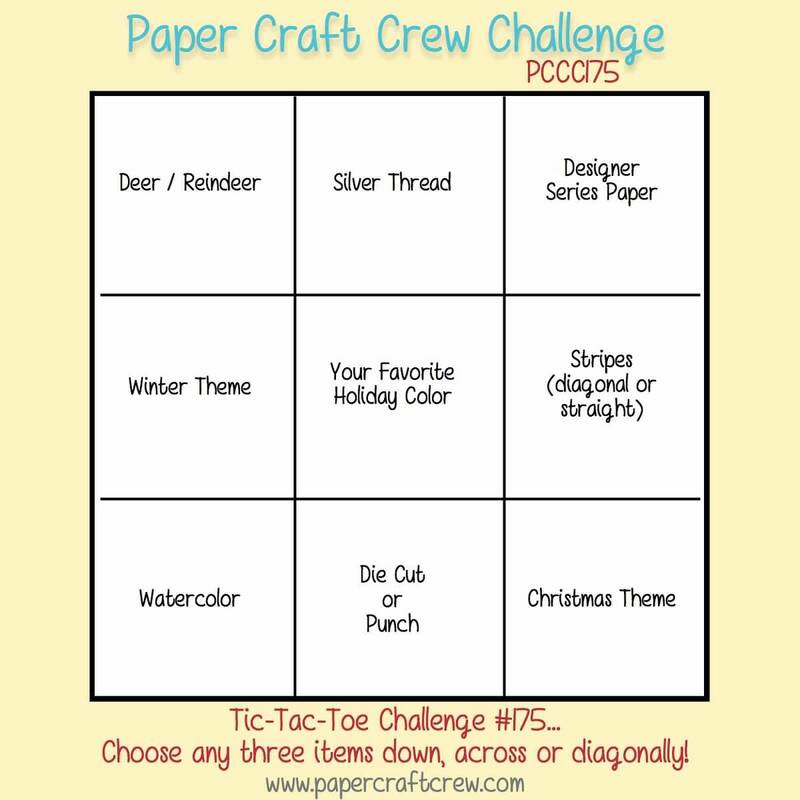 This week is a special challenge in 2 ways; first, it’s a Tic-Tac-Toe challenge; you choose one row for your design – it can be horizontal, vertical or diagonal – and use those 3 items in your row to create your card. Secondly, this is a 2 week challenge, which means that you have 2 weeks to get your card designed and linked up – because we know that it’s holiday time, and everyone’s schedule is not ‘as usual’! I decided to use the middle row, vertically – Silver Thread, Your Favourite Holiday Colour, and Die Cut or Punch. I really tried to stay to one colour – but I have more than 1 favourite for Christmas! I really like blues for winter; they remind me of the crisp, coldness of the winter air and snow. Then of course, the traditionalist in me has to have RED!! Such a fun, vibrant colour, and Stampin’ Up!’s Real Red is my favourite. When I first saw the preview of the Holiday Catalogue back in -good grief, was it August? – and I saw the Snow Place stamp set (and the fact that it had matching framelits!!) I knew it was going on my list! So that’s what I decided to use, and thought it was a fun card to see during the Christmas holiday. I started with a panel of Whisper White cardstock, and die cut 3 ornament shapes down the right hand side. I then stamped the snowflakes all over it, using Pool Party ink. Using another piece of Whisper White, I stamped 3 of the penguins using Archival Black ink, and die cut them using the Snow Friends Framelits. I added a Santa hat, a pair of earmuffs and a scarf, stamped in Real Red, Pool Party and Cucumber Crush inks. Boy, I love those matching framelits – did I say that already?! After dressing the penguins and colouring their beaks using the Pumpkin Pie marker, I peeked each of them through the die cut-outs, and attached them in the back using Stampin’ Dimensionals. I added a bow at the top of each ornament made using the Silver Cording Trim. 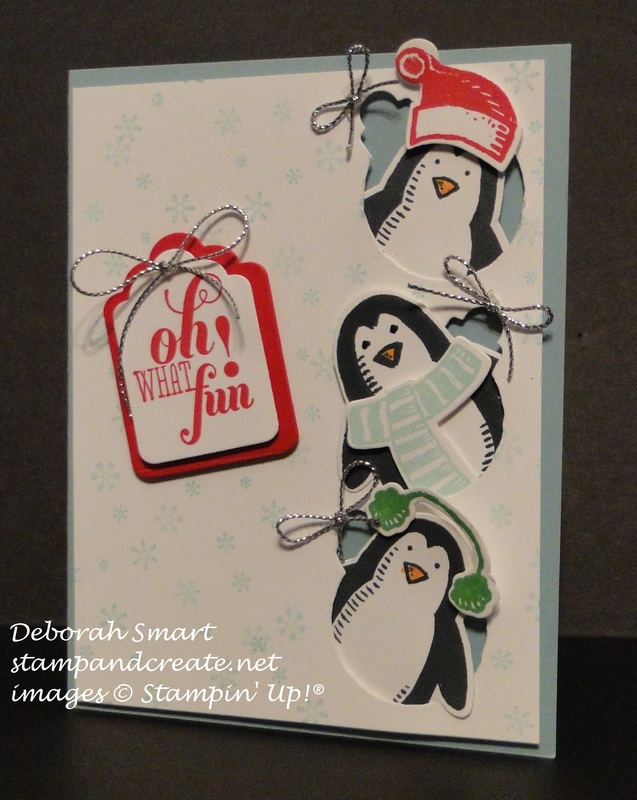 I used a retired stamp set Christmas Messages and inked up the sentiment – doesn’t it just suit those penguins? – in Real Red ink, and used the Tags & Labels Framelit Dies to die cut it and a another one in the next larger size in Real Red cardstock. This was attached to the card front with Stampin’ Dimensionals, and then I added a bow of Silver Cording Trim to the top of it. This panel was then attached to a card base of Pool Party cardstock. I hope you’ll head over to the Paper Craft Crew blog and see the amazing cards that the rest of the design team made; they’re awesome! I am honoured to be working with such an amazing group of fabulous designers; they’re all wonderful people! If you don’t have time to return to my blog before Christmas – I hope you have a wonderful time with your favourite people, however you celebrate the holiday! It’s my pleasure and honour to have you visit my blog; thank you so much for spending your time with me! Until next time, my friend – happy holidays, and happy stamping! Deb those penguins peeking out are so full of winter fun. Love your card. Merry Christmas to you and your family.